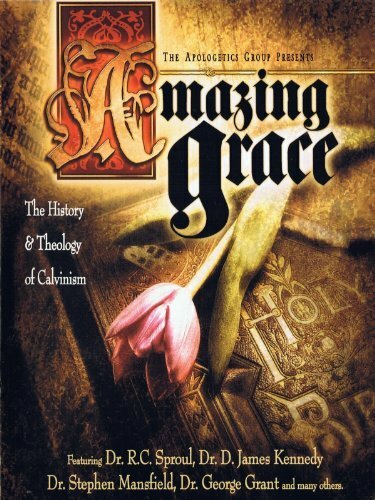 A friend gave me a copy of the DVD set Amazing Grace: The History and Theology of Calvinism (2004), in order that I might be better educated about various Calvinistic perspectives. Being a Wesleyan-Arminian who has consistently come up against modern antinomian Calvinists, I admittedly have developed a prejudice against all Calvinists, that only by the grace of God, I will hope to be progressively delivered. My experience with some Calvinistic Baptists has almost always been negative, using “once saved, always saved” as an excuse to live in total sin and carnality all the days of their lives. But then again, there are the Paul Washers, and people like this who believe in lordship salvation, and Calvinistic, Puritan holiness. Which is something I’ve caught wind of, but have never really experienced very much of in my life. It was for this reason that my friend gave me this DVD, to balance me out a little bit, so I won’t think that all Calvinists are just demon possessed. “Calvin’s teaching is the true teaching of Christ, Paul,…Calvin’s theology is the true exposition of Scripture” (1:07:37), declares Dr. Kenneth G. Talbot. This quote sets the tone for Disc 1. It is to prove that Calvinism is the true view of salvation; and that Arminianism is a false doctrine, a heresy, that was so out of line with the Protestant Reformers to be considered “out of Hell the Pelagian error” (2:39:26). George Whitefield is quoted as saying, “The Arminian gospel is no gospel at all.” The attack on Arminian soteriology is long, thorough, and takes hours. This is seen as a fundamental necessity for preaching Calvinism. Calvinism is the true Biblical understanding of salvation, the DVD argues, and so it stands to reason, Arminianism must be a heretical doctrine. The motive for all of this is THE GLORY OF GOD. The Calvinistic system argues that Arminianism, with its emphasis on man’s responsibility to live holy and keep his faith alive, is actually a religion of works-righteousness, self-righteousness, and nothing more than Pelagianism. Arminianism is a religion of PRIDE. Calvinism is a religion of HUMILITY. Who is defining these words? They seem to change throughout the DVD. I will give my definitions. Then I would relay the reader to look up theology dictionaries, multiple times, just to confirm the words’ definitions are not changed or altered throughout the discussion. Pelagianism – The belief that man has the will power of himself to live the Christian life, and perform all the moral commandments of God perfectly on his own strength. Synergism – The belief that the Holy Spirit draws men to faith and obedience to the Gospel of Jesus Christ, influences them, broods over them, and helps them to choose the right way of the Christian life; yet that energy and power of God completely allows for fallen, dead, sinful wretched men, to resist the Holy Spirit, and reject the Gospel, if they so choose. Man’s ability to choose the Gospel now, and later, here a little, there a little, is always present, with the sovereign help, and influence of the Holy Spirit’s presence in their life. Man is totally responsible for his present relationship with God, because the Holy Spirit is always there reaching out His hand of divine help. Monergism – The belief that men are dead in sin, and so, the only way they can live the Christian life, is if the Holy Spirit chooses to come into them; regenerate them, and give them power to be a Christian. The Christian does not have a free will, or any ability to choose good or evil; he is simply the regenerated, resurrected product of the Holy Spirit coming into him. I noticed throughout the DVD, that Arminianism was not explained in Synergistic terms at all (or at least not for very long). It was explained in Pelagian terms almost exclusively; one time, the host mocks Arminians as if in a graceless, Spirit-less state, completely dead, trying to preach resurrection to a graceless, Spirit-less graveyard. But that is the PELAGIAN picture! Not the Synergist-Arminian picture! This message is all throughout the DVD: PELAGIANISM = ARMINIANISM. So, so wrong! [Not to mention, John Wesley is never mentioned in Disc 1; but in Disc 2 is called “the great Arminian evangelist!” (27:13).] Whenever the Arminian view was taught and explained, it was to show how prideful that religion must be, to claim that man’s repentance and man’s faith in the cross would give him reason to boast, in contradiction to Ephesians 2:9. But the godly Arminian does not pride himself for anything! For even the power of repentance and faith is a gift, that must be granted to him (2 Tim. 2:25); and on top of that I boast in nothing but the cross of Christ (Gal. 6:14), showing how much I trust in Jesus, and not myself! I learned that there are different kinds of Calvinists and different kinds of Arminians. But this DVD lumps them into two camps. We have to remember that the wheat and tares have been sown together (Matt. 13:25). There are saved and unsaved Calvinists; and saved and unsaved Arminians. This should have affected the judgments of the DVD host. But it did not. An unsaved Calvinist will use his theology to justify carnality and not practice evangelism. An unsaved Arminian will use his theology to be a Pelagian, and puff himself up with his religious works and pride; and maybe even use the universal atonement viewpoint for justifying a belief in universalism! So, you can imagine the dynamics going on here. Saved and unsaved, confusion, and clarity, spreading throughout the Calvinist-Arminian debate. Wow! It just makes me want to stop arguing, and say, “Without holiness no one will see the Lord” (Heb. 12:14). In the end, that’s what’s going to pass the fiery test of God on Judgment Day; not any philosophical opinions about grace and free will. Romans 9: the contested chapter on PREDESTINATION AND ELECTION. The DVD makes God out to show favoritism, saying, “Nowhere is man even given a scintilla of responsibility for his election” (1:48:46). I disagree: “My brothers, be all the more eager to make your calling and election sure. For if you do these things, you will never fall” (2 Pet. 1:10). It would be utter nonsense for Peter to be commanding the Christian brothers to make their election sure, if as the DVD argues, man has no “responsibility for his election”! Dr. R. C. Sproul argues that Romans 9:14 anticipates an objection to Calvinistic election: “What then shall we say? Is God unjust? Not at all!” But this quote doesn’t mean Paul was anticipating an objection to Calvinism, as if it were Biblical. John Wesley–the Arminian preacher–said in his Notes Upon the New Testament, that God has fixed terms of repentance and faith for men to be saved. If they use the grace that God has given them, with the power of the Holy Spirit, and repent and believe, like they are told to, then God will “have mercy on whom He will have mercy”! (Rom. 9:15). Namely, on those who accept the New Covenant by repentance and faith! A pagan moralist may think this is unjust for “those who have never heard the Gospel,” but who are they to question the mysterious wisdom of God? What if all men are given a chance? But so many resist the workings of conscience, and so, never reach the point of hearing the Gospel: which is the voice of Conscience itself. And what pride can there be in this? : In pleading for the sheer grace and mercy of God to save our wretched Arminian souls?! MORAL GOVERNMENT / MORAL INFLUENCE THEORY is the doctrine that Jesus died on the cross to suffer as a moral example for Christians to follow; but not as a sacrifice for our sins. This is portrayed as “the Arminian view” of the CROSS! (2:31:01). There are some Arminian liberals who probably believe this; but this was certainly not the classic Methodist or Wesleyan-Arminian view (or anything you will find in books by Schmul Publishing or Francis Asbury Press). Wesley saw the cross the same way that Calvinist Puritans do: PENAL SUBSTITUTION: SATISFACTION OF THE WRATH OF GOD (see Kenneth Collins’ The Scripture Way of Salvation: The Heart of John Wesley’s Theology, pp. 84-86). This is why Wesley said, “I think on justification just as I have done any time these seven and twenty years; and just as Mr. Calvin does. In this respect, I do not differ from him an hair’s breadth” (Rev. John Wesley’s Journal, May 14, 1765). PERSEVERANCE OF THE SAINTS or “Once Saved, Always Saved” in Calvinism is the belief that it is impossible for a truly saved Christian to lose his faith, holiness, and salvation. The warning passages in Hebrews are usually interpreted as a warning of God’s discipline in this life; but certainly not a warning to saved Christians about going to Hell in the afterlife. The Arminians feel this is a hazardous doctrine that encourages passivity; and discourages holiness. But the REFORMED CALVINIST (Lordship Salvation) replies: “Ah, ah. Not all Calvinists believe in the license to sin. We know that Zane Hodges’ Absolutely Free! is an antinomian heresy. But the Whitefields, Edwardses, Spurgeons, and Bunyans all required holiness of Calvinists, or they were never saved in the first place.” John Gill is quoted in his commentary for teaching that Jesus died for our past, present, and future sins. So, don’t worry, you’re secure in Christ. But remember now, says Wesley and the Arminians: “We are to have ‘faith in His blood, to declare His righteousness for the remission of sins that are past’” (Rom. 3:25, KJV). SINS THAT ARE PRESENT? SINS FUTURE? The Bible seems to remain silent about the remission of sins that are present and future, but the Calvinist preachers will not remain so silent. To me, as an Arminian, the only remedy for present sins, or potential future ones, is freshly repenting after I sin those sins, and confess those sins, and know then that God will forgive me when I repent, and maintain that clear conscience relationship with Him. To me, this is what it means to live “in holiness and righteousness before Him all the days of our life” (Luke 1:75, NKJV). And this is not a cross-less, or blood-less repentance either: every time I repent, and confess sin, I am also looking again to the cross for atonement from a fresh wrath of God at a freshly committed sin–however, God is still my Father. I liked this disc a lot better. Although preaching the Gospel seems to be logically contradictory to the doctrine of Calvinist predestination–they reply, “It does not matter. Christ commands the Great Commission. We don’t know who the elect will be; only God knows. It remains our responsibility to go into all the world and preach the Gospel to every creature (Mark 16:15).” (02:18). Arminian evangelism is again construed through pride: “If we don’t preach the Gospel, who will? God must need us!” (04:10). On the contrary, Christ as an apparition appeared to Paul on the road to Damascus (Acts 9:3). God doesn’t need human missionaries; He just commands them; and it should be our pleasure to obey. George Whitefield and William Carey are referred to as Calvinistic missionaries; so, it proves that Calvinists don’t have to be unevangelistic and stuck in their church buildings. It has been done before! Finally: preach the law, the cross, and “repent and believe!,” and be ready to use apologetics to defend the faith. “While the concept of ‘free grace’ dates to the 17th century or before, ‘Free Grace’ became the popular term for the opposing camp in the lordship salvation debate, and for the ideas against lordship salvation by authors such as Charles Ryrie, Chuck Swindoll, Charles Stanley, Norman Geisler, and Bill Bright” (“Lordship Salvation Controversy,” Wikipedia). “Where you land on the lordship question will also have far-reaching implications for your views on assurance, faith, repentance, eternal rewards, human depravity, the role of the moral law, and a host of other crucial doctrines. Almost no aspect of soteriology is left untainted by the errors of no-lordship doctrine. Belcher, Richard P. A Layman’s Guide to the Lordship Controversy. Southbridge, MA: Crowne, 1990. Boice, James M. Christ’s Call to Discipleship. Chicago: Moody, 1986. Chantry, Walter. Today’s Gospel: Authentic or Synthetic? Edinburgh: Banner of Truth, 1970. Chrisope, T. Alan. Jesus Is Lord. Welwyn, Hertfordshire: Evangelical Press, 1982. Crenshaw, Curtis I. Lordship Salvation: The Only Kind There Is! Memphis: Footstool, 1994. Gentry, Kenneth L. Lord of the Saved: Getting to the Heart of the Lordship Debate. Phillipsburg, NJ: Presbyterian & Reformed, 1992. Hoekema, Anthony A. Saved by Grace. Grand Rapids: Eerdmans, 1989. Kuiper, R. B. God Centered Evangelism. Edinburgh: Banner of Truth, 1961. Lescelius, Robert. Lordship Salvation: Some Crucial Questions and Answers. Asheville, NC: Revival Literature, 1992. Reisinger, Ernest C. Lord & Christ. Phillipsburg, NJ: Presbyterian & Reformed, 1994. ___________________. Today’s Evangelism: It’s Message and Methods. Phillipsburg, NJ: Craig, 1982. Tozer, A. W. I Call It Heresy! Harrisburg, PA: Christian Publications, 1974.